Like all good things, caring for your lawn takes time and preparation to truly see results. If a lawn is not properly prepared for spring, it can lead to poor health of the lawn causing an influx of weeds, brown spots, and even pests. Have no fear; getting your lawn into shape is easier than it sounds. Start by raking and mulching any leaves in the yard. 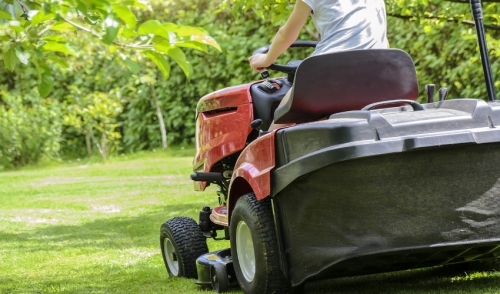 Simply remove the bulk of the leaves using the mulch function on your lawnmower or rake. Leave about a quarter-inch of mulch remain to give your lawn a boost by allowing the mulch to compost and provide organic nutrients to your lawn. The next step is adding a thick layer of mulch around the base of your garden, shrubs, trees, and other plants around your yard. During this weird time of the year where temperatures can frequently change from cold to warm and visa versa, mulch will help regulate temperature soil protecting your plants and allowing them to continue to grow. This is great if you have emerging bulbs and perennials looking to sprout and thrive. Mulch will also help with retaining moisture, deterring weeds, and increasing the number of beneficial soil microorganisms within the dirt. There are various types of mulch to choose from. Feel free to use the leaf mulch from your lawn, compost, or tree bark. Next, walk though your lawn and re-seed any dead spots. Make sure to cover the spot with compost or fertilizer, and water frequently to help with new growth. New grass can be tough to maintain if proper attention is not given. Be on the lookout for dead limbs and weeds around your lawn. Prune back anything that seems dead and apply weed control to keep new weeds from forming in your lawn as temperatures slowly rise through the season. The final step in preparation for spring is aerating your lawn. Lawn aeration is key to making your lawn healthy and green. Aerating your lawn will make little holes in the lawn so that oxygen gets to the roots of the soil allowing it to breathe. This will allow organic fertilizers and nutrients to gain access to the root system of the lawn. It will also loosen up compact soil allowing the root system to grow and increase water absorption. You may also utilize a soil conditioner to further enhance the growth of your lawn. Don’t forget to check any irrigation systems and equipment needed for your lawn. Replace anything that may be broken so that you’re always fully prepared.